Tutarlı bir şekilde yüksek müşteri puanları ve üstün kalite notlarıyla beğenimizi kazandı. Our users have told us USA Hostels San Francisco is 'very clean, super friendly and very welcoming' with a 'perfect price/quality compromise' and 'really helpful and down-to-earth' staff who 'really make this place'. One Hostelworld guest said the hostel is ideal whether you want to 'sit back and relax, party, meet new people or spend some time on your own'. The hostel also has 'something going on every night', like walking tours, free drinks and tickets to local matches. Rated Most Popular San Francisco Hostel for the 4th consecutive year by Hostelworld guests! Biking the Golden Gate Bridge, free city walking tours and weekly pub crawls are just some of the ways we’ll help you have memorable San Fran experiences. We have heaps of hang out space, with a large lounge, yoga room and roomy kitchen and dining areas. Join us for a hostel dinner, a billiard tournament or karaoke to get your night in San Francisco started right. And when it's time to relax, you have a choice of hotel quality private rooms or dorms with our exclusive privacy pods. - only four beds per dorm, with real mattresses (no foam stuff) and comfy duvets. - free use of hairdryers. Please Note: Prices listed do not include taxes. See Hostel Conditions for tax details. We welcome guests from everywhere outside of San Francisco county. At check in, international guests must present a valid passport. US residents must present valid government issued identification (ie: driver’s license, state id card, passport). Guests may also be asked to present proof of onward travel. We require all guests to be 18 or over to stay at our hostel. Anyone under 18 has to be accompanied by a parent/guardian but this also needs to be approved by a manager. Please contact us directly before booking with anyone under the age of 18. Please note that we try our best to keep people travelling together in the same room. However, sometimes due to availability and/or booking patterns, we may not be able to do so. If you have a special request concerning this, please email the hostel directly. Groups of more than 10 cannot be confirmed via Hostelworld and must contact the hostel directly for a reservation to be accepted. Besides being located only a few blocks from the cable cards and Powell Street (which is kind of the heart of the city), what makes our location special is two main things - staff and facilities. Many of our staff have been with us for years and really do enjoy helping guests come to love San Francisco as much as they do. Our staff know all the great, off-the-beaten path places to go and are happy to share their local secrets. 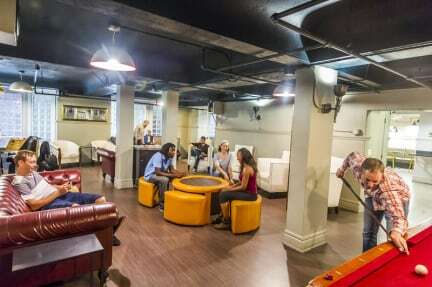 And for guests choosing to 'hang out' at the hostel, there are a variety of places within the building where they can get comfortable. If they need alone time, all our dorms feature 'privacy pods', an exclusively-designed addition to each bed that features a light, shelf, outlet and screening from other guests. Or, they can hide away in our quiet library and catch up on reading. If they are craving a movie, we have a 50-seat theatre. If they're ready to mingle, we have a large lounge with pool and foosball tables.